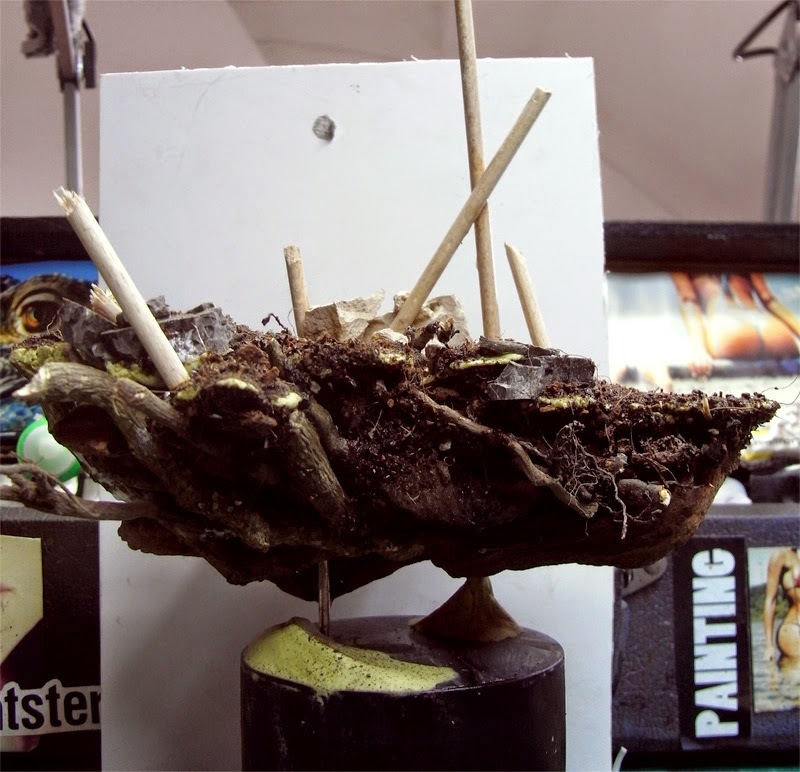 MASSIVE VOODOO: Step by Step: Your Waaaghh ends here! 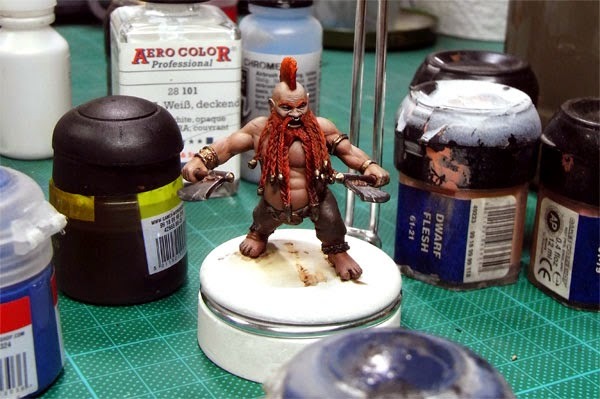 again, you decided via Massive Voodoo's year of the painter's last Tutorial Voting which article should be up today. The Winner lead us back to a little time travel to the year 2012 and a project called "Your Waaaghh ends here!". 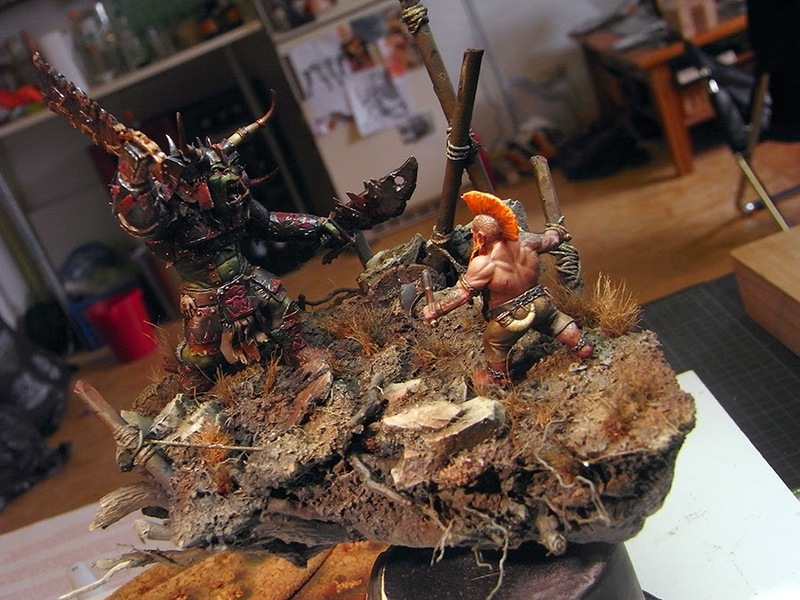 The project was a comission for Mati and Roman for a private collector from the US. While Mati sculpted the unique models, Roman did the paint- and basing job. This article gives you insight into the project, a walkthrough on the journey to see this one finished. 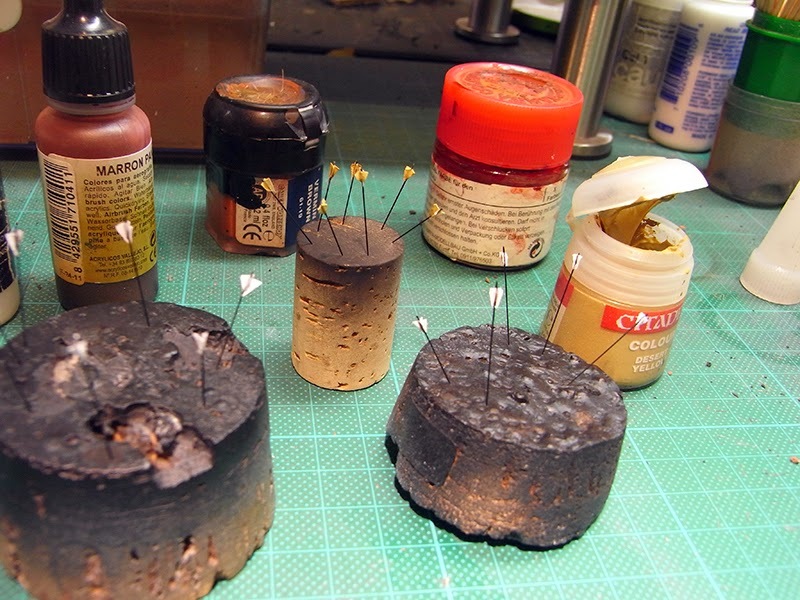 It is going into little details here and there, but is not giving exact painting recipes for particular areas. Let's start and see what Roman has to tell or at least how much he remembers, eh? Well, 2012 - it's been a while. So where is my mind and memory? It felt really cool to be comissioned with this project. I mean Mati sculpting unique sculpts, which are only meant to be placed into this piece. The comissioners vision came from a computer game trailer and shows a Waaagghh-Boss whos path is blocked by a stubborn Dwarf Slayer. I was really anxious to recieve the pieces from Mati via postal service as soon he would be done. 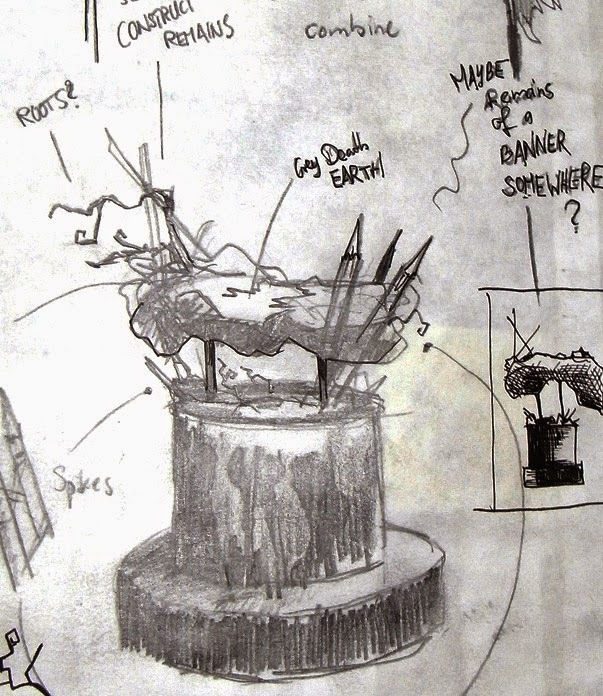 Meanwhile I prepared my mind with some sketches for the base to catch the scenery and athmosphere of the trailer. 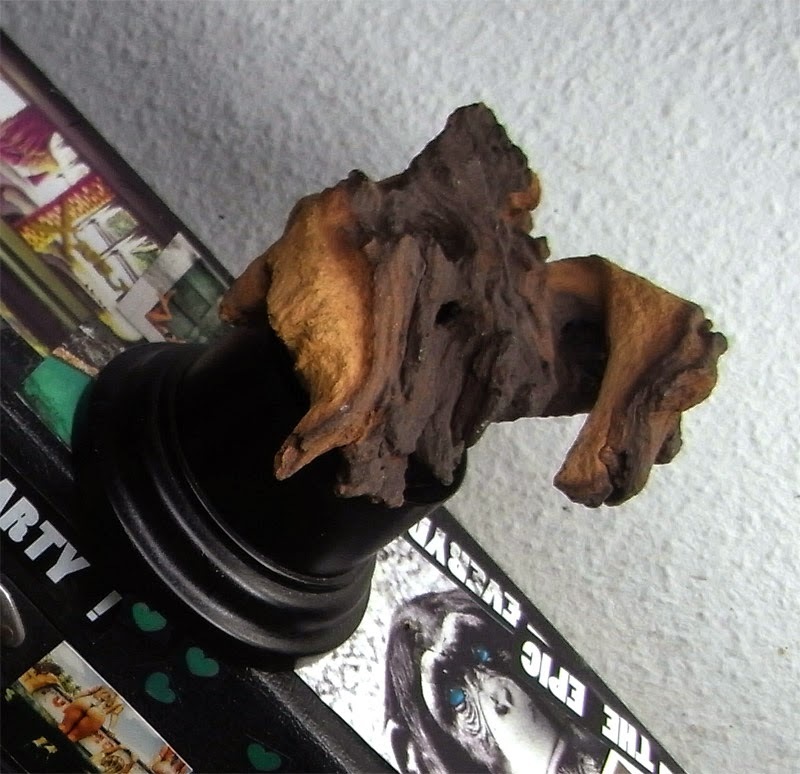 I found a cool root piece which I got from Sockelmacher.de and planned to use it on top of a more expensive black plinth. So far to the plan. 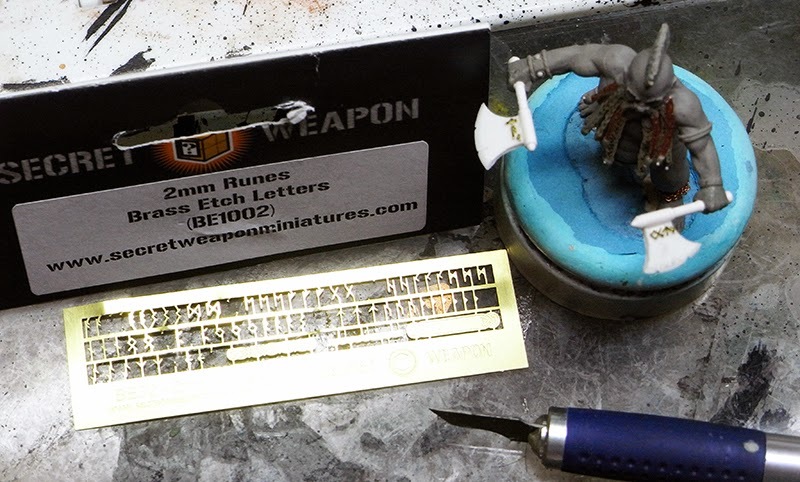 After a little while the sculpts arrived and I placed some brass etched runes to the Dwarf's axes. Cool Stuff by Secret Weapon indeed. 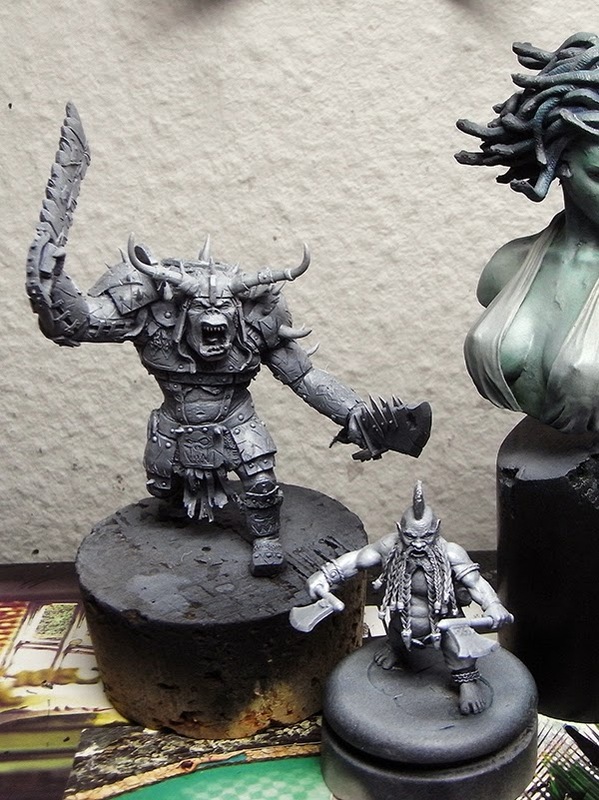 Sadly I do not have any photos of the Orc sculpt, but I found some on Mati's Putty&Paint Profile - check here. to get them ready for painting. 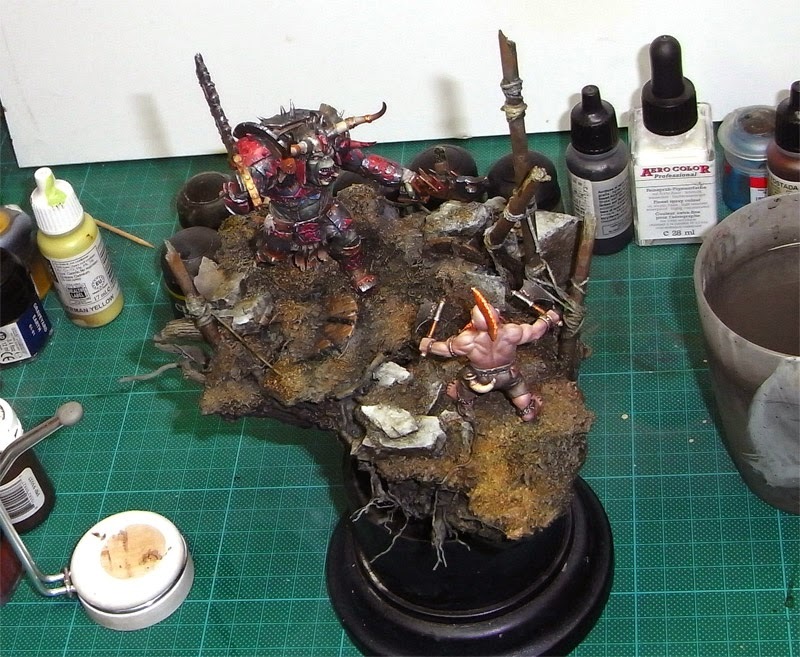 For the base I started with the sketch in the back of my head and did some sawing of that wood piece, pinned it with thicker iron bars to the black plinth and added some roots via superglue and Milliput on top of it. Just to get an idea. 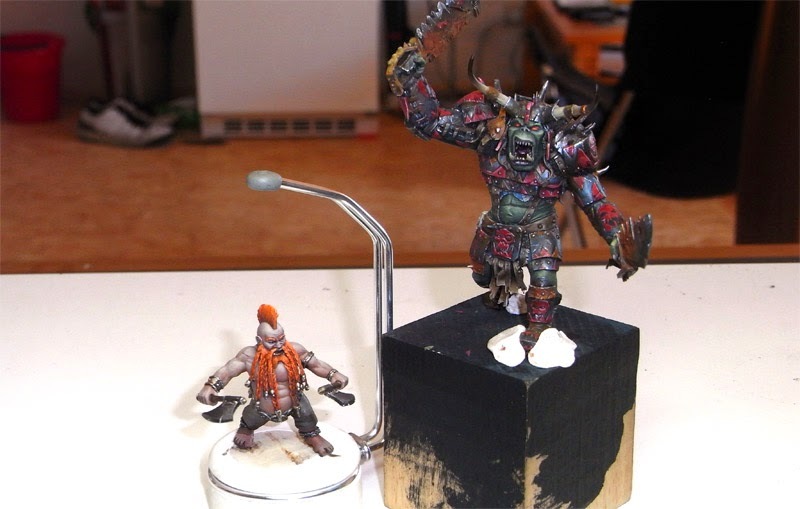 I already did some really simple colour applyments to the models - metal basic to the Orc and skin basic to the dwarf. You can see it here where I checked for the poses of the models on the base. Soil and siege rubble on that base and I was happy. 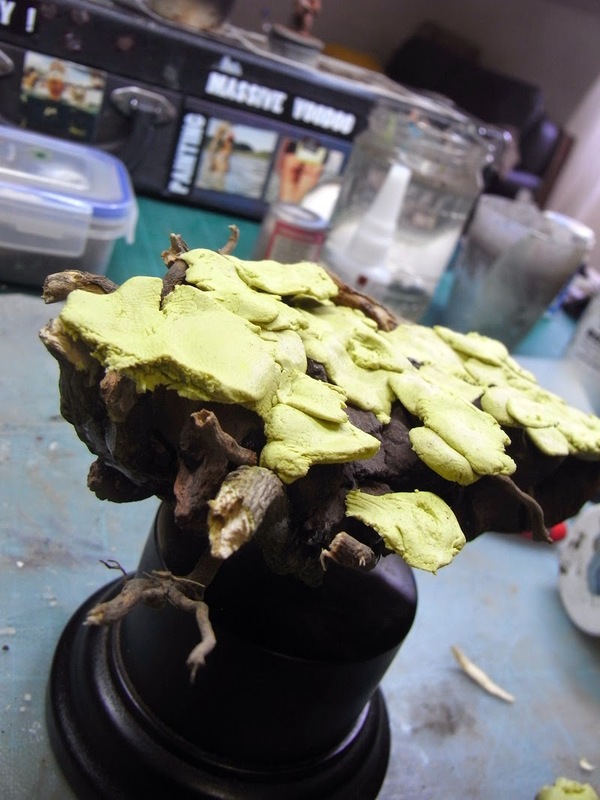 Something was missing in that rubble and I sculpted two wooden shields from Magic Sculpt. You can do your own armoury too - check this article! 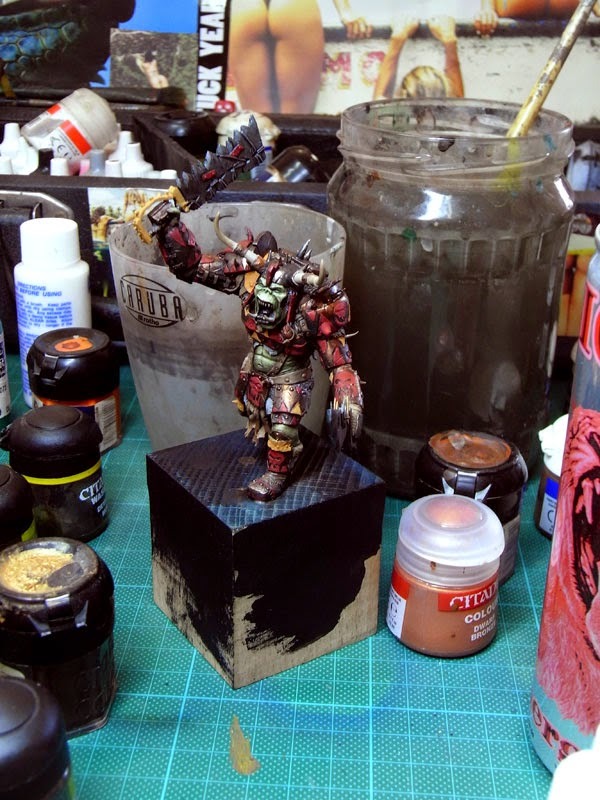 Painting the base was truely fun as I love to sketch my way into it using a technique that mixes the colours wet in wet on that base. It's a sketch nothing more, but fun. You can find this particular technique used and explained in the Step by Step of the Nightwatch. Sometimes you can not do this technique with a small brush, so I recommend using a slightly bigger one. 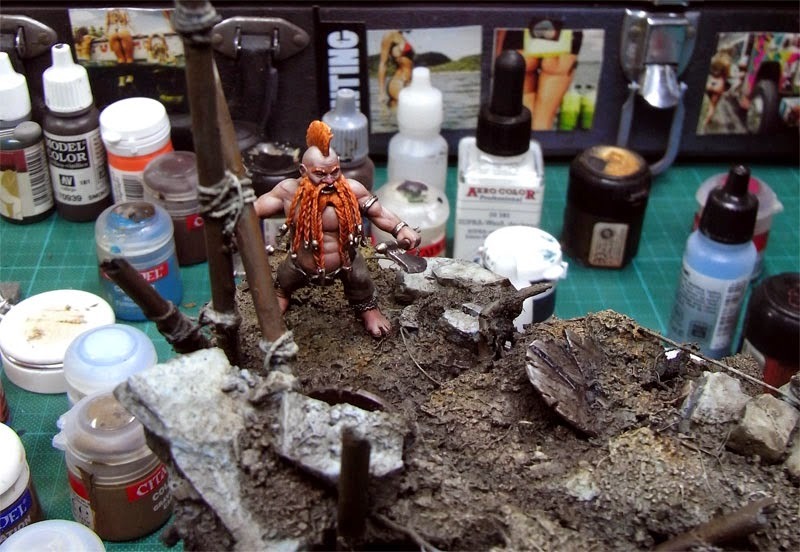 Ok so far for the base sketch I went back to the Dwarf and put some time in his different materials, first sketchly preparing all different materials. Working my way further by adding highlighst and shadows to these different materials. 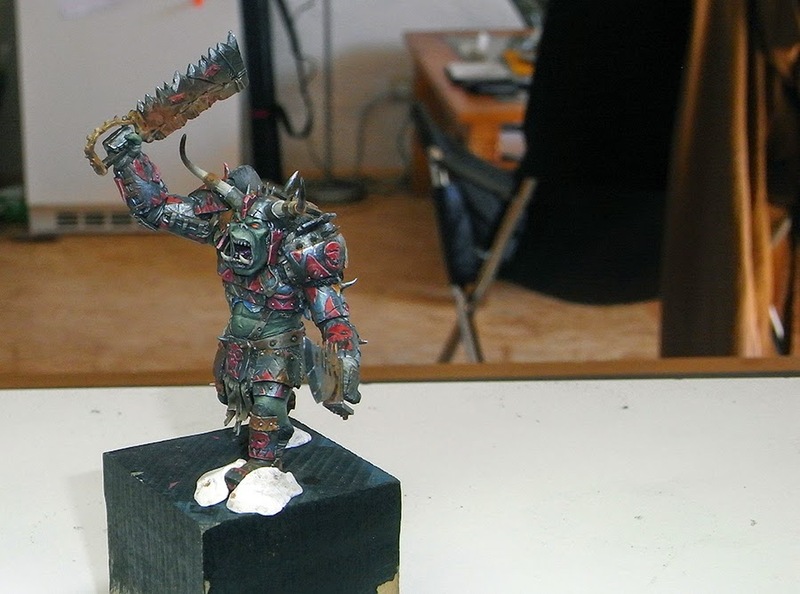 Did the same to the Orc, starting slowly to find all that different material. Honestly, the Dwarf was more joy as the Orc had so much different stuff going on to drive me mad. Orcs, eh? 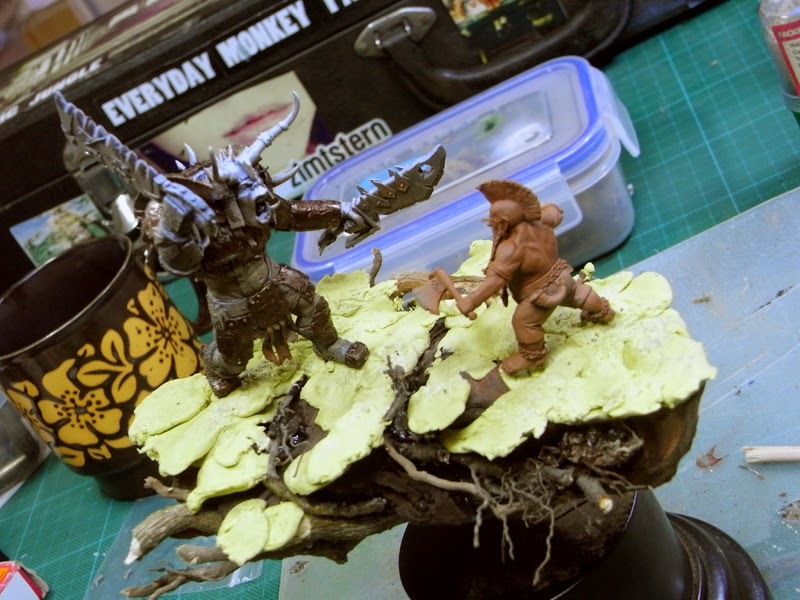 Added more detail to it and made ready for final details on Orc and Dwarf. 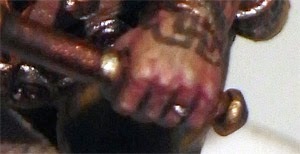 Means more contrast here and there, stronger edge highlights on the metals and such. Now it was time for another base check once again. These are very important for me to see if the whole thing works together. 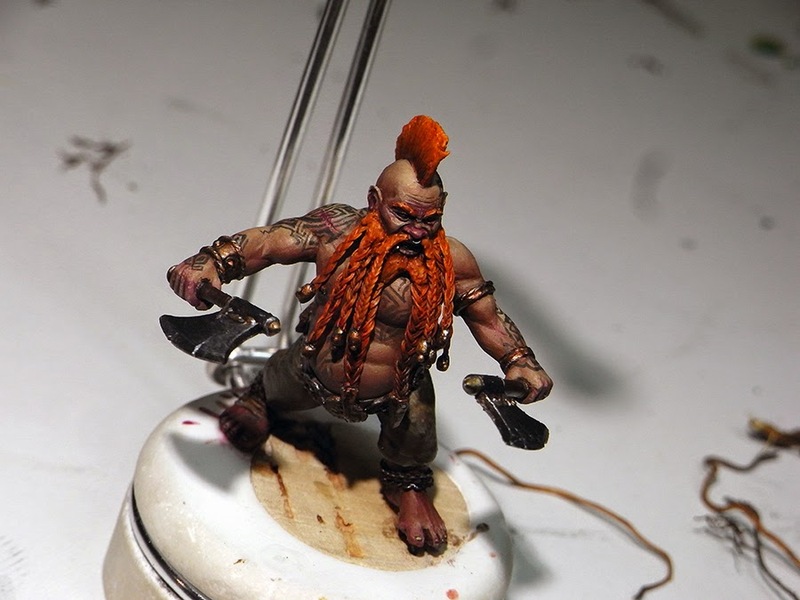 Dwarfy here recieved some more details in his areas, like more contrast in the skin, tattoos, some wounds, details on the leather, work on the metals and highlights on his hair. 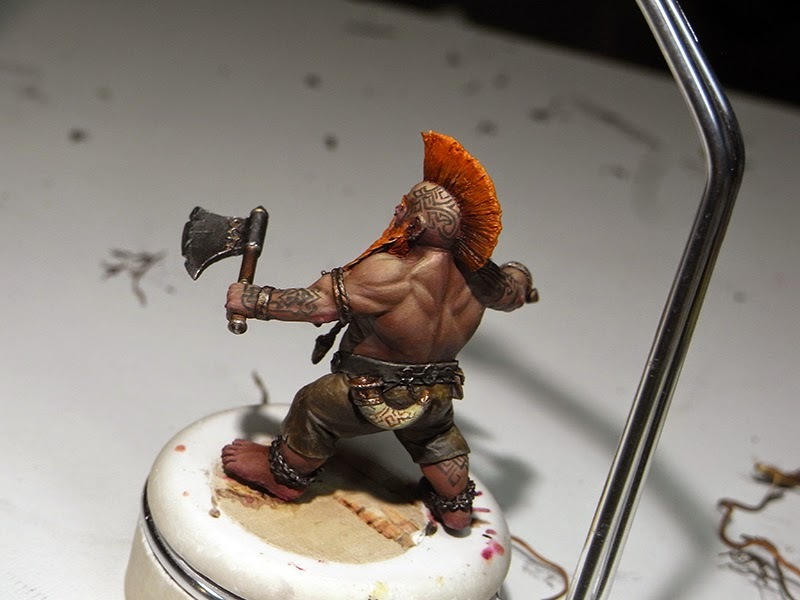 A little colour variations to the skin ca work wonders. Not only skintone there but some purple, green, yellow ... fun and nice effect. 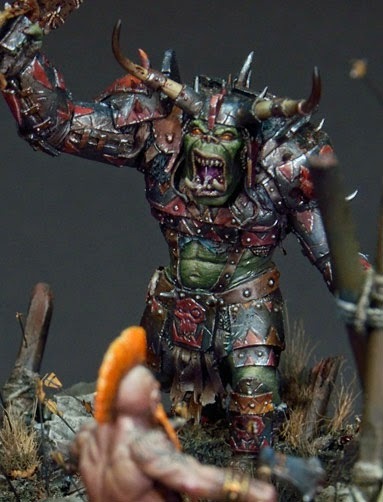 Sadly the I do not have any photos of the detail work on the Orc as this guy just drove me mad back in 2012 with his crazy detail stuff going on, but nevermind. 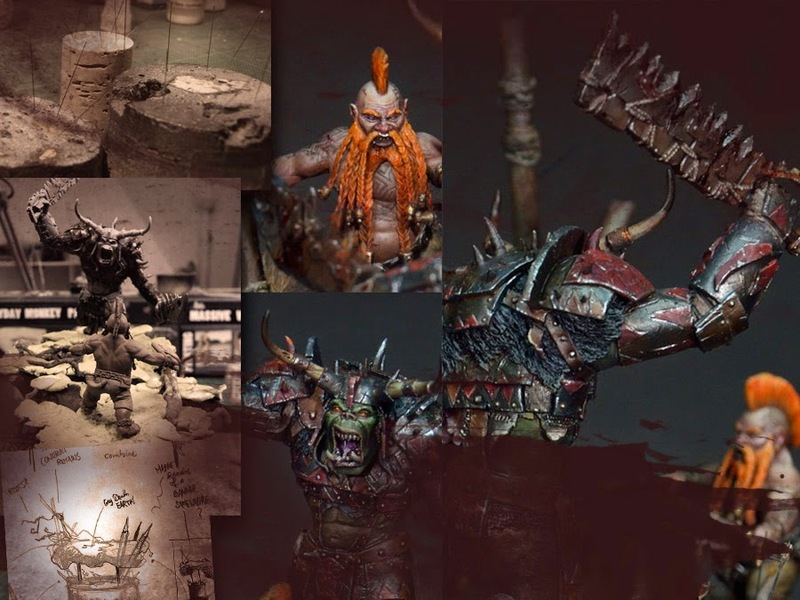 If you are interested in Orc Skin, check this article over here! Something was missing to really catcht the mood of a battlefield. Yes, arrows. 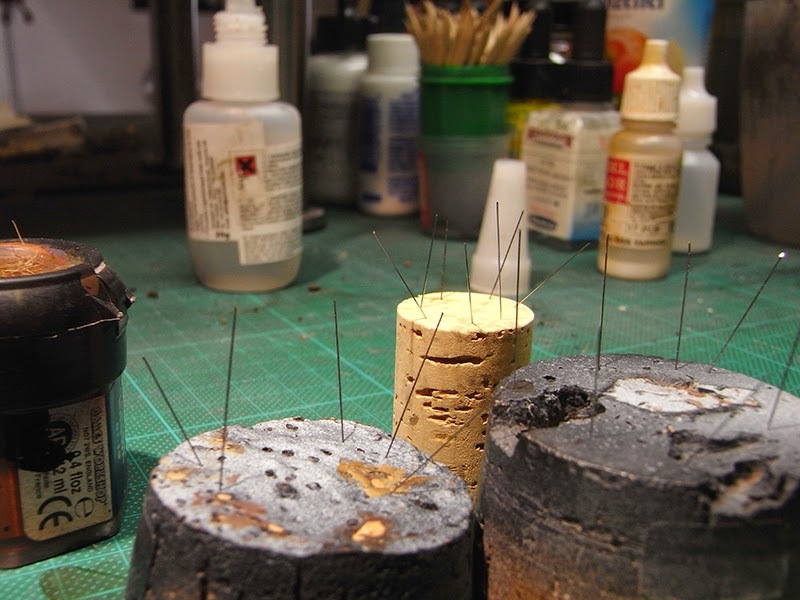 You can find an article on how to create them with an accupuncture needle here behind this link. 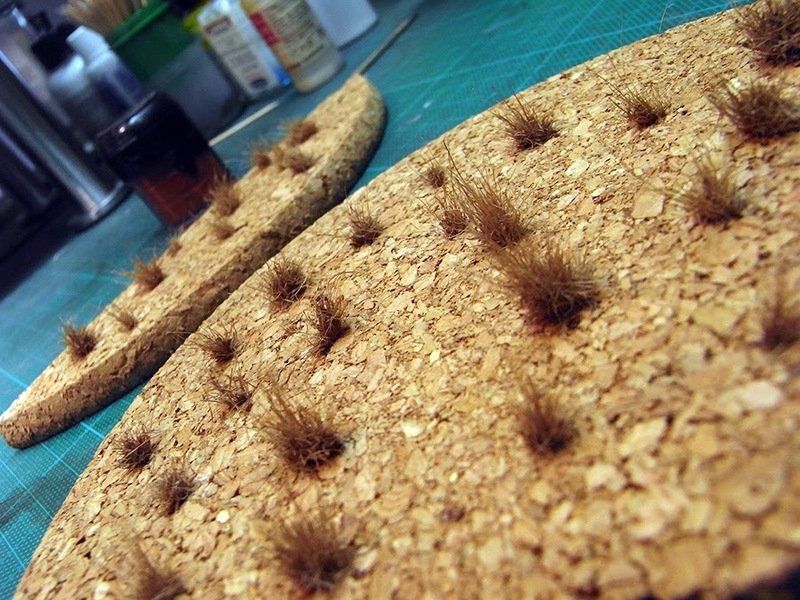 I prepared some detail grass on a piece of cork. 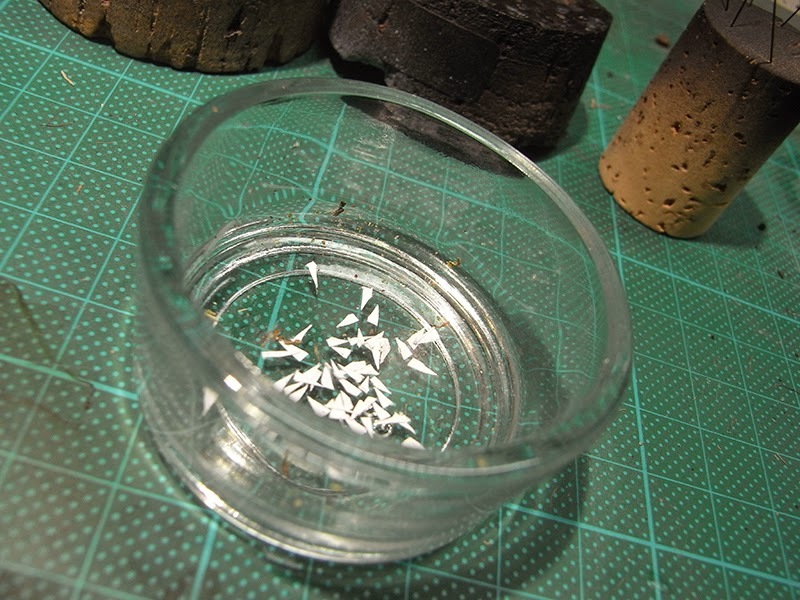 Glued it to the cork as it is easier to handle while washing, drybrushing and for removing it afterwards. Need an article about detailed grass? Well all in all the project was a not an easy one back in 2012. 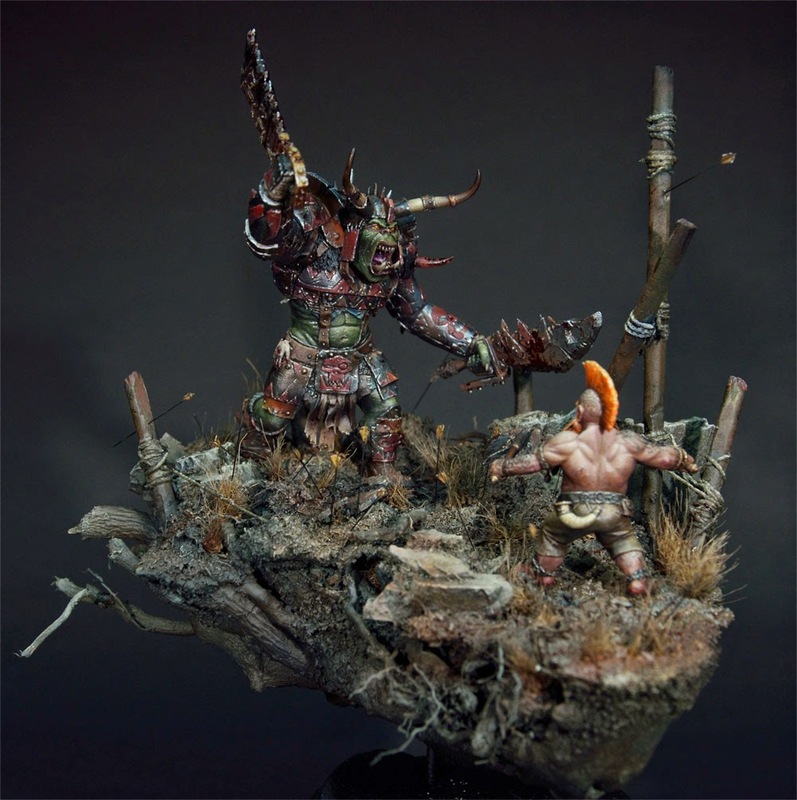 Its size, both models are in scale 54 mm and that base went huge. It was a lot of fun though and the customer, Mati and I were happy with the final result of our collaberation. If you like you can find more photos of it via Putty & Paint. I hope you enjoyed the article even it is no detail step by step plan on how I did every single inch in this project. It is more a walkthrough that helps to see such a big project grow. I for my part do enjoy when the work happens at all pieces at once, meaning that they grow together to a final stage. First sketch, hard work, detail work. This helps me always keeps the mood of a piece together as I would just fail in this if I would paint one area to complete before going to the next one. A little side-story on this project. It had to be shipped to the US and Raffa helped me carefully removing the pinned (!) 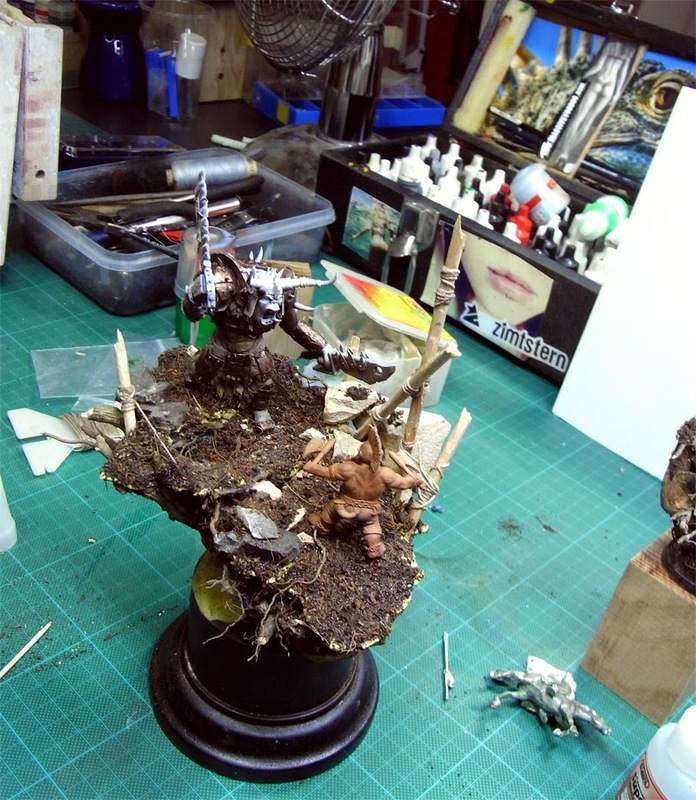 models from that base again to be able to pack everything carefully in their own plastic boxes. So three plastic boxes were used for the dwarf, orc and base all wrapped up in a bigger box for shipping the miniatures. What do you think? 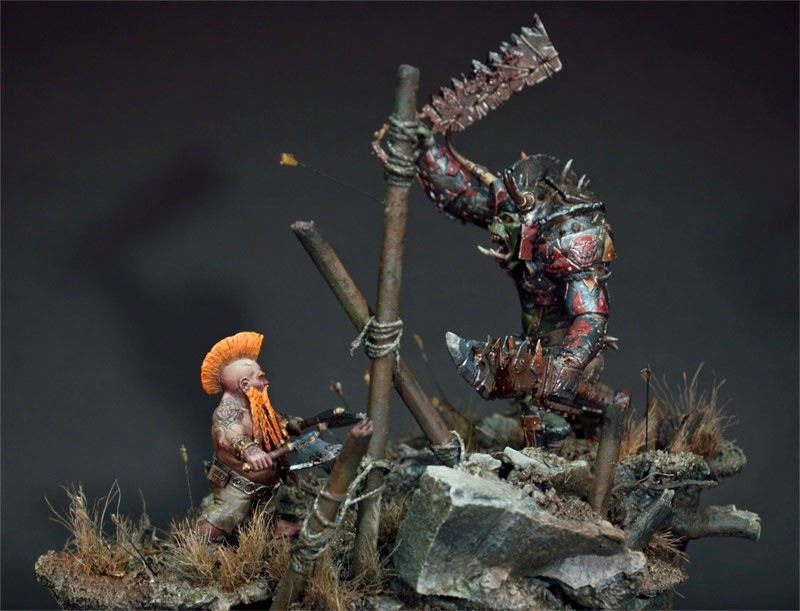 Can the little Dwarf stop the Waaaghh! just in that particular moment? Do you see the right purpose in his eyes? Or is he just dead meat? PS: Find more Step by Step articles here! There are 11 Kommentare for Step by Step: Your Waaaghh ends here! 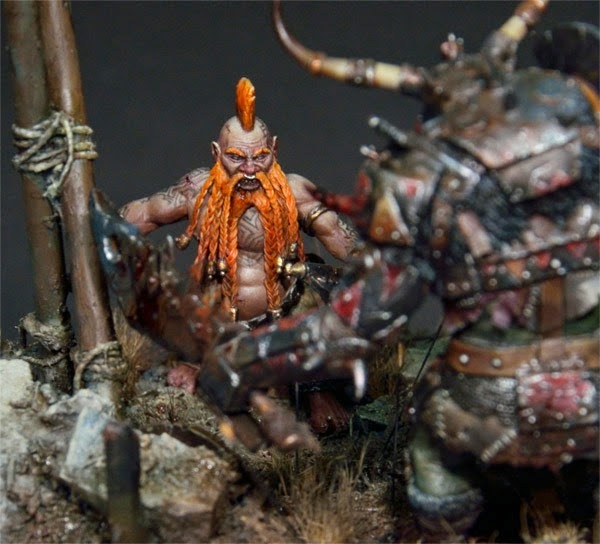 Reminds me on the joke where an Ork meets an Dwarf and asks him for the way.... Great work as usual! Wow.. very cool! Also very cool how many side tutorials there are linked to this one piece! Almost like a maze of more information! Wowzers! 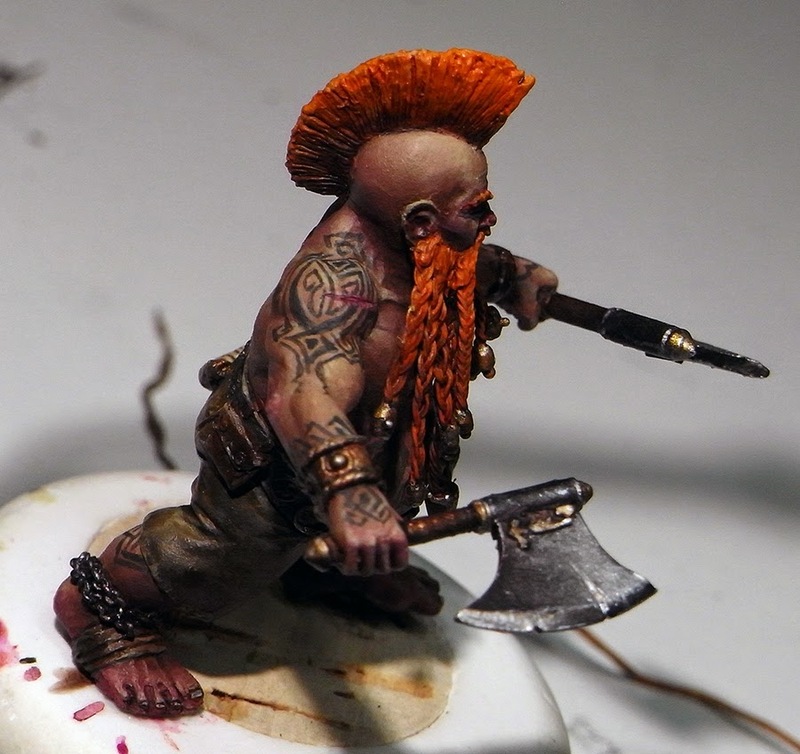 Would it possible to get a tutorial on how did the dwarf skin? It looks very very good! Well, sure it is always dangerous to sent something fragile via parcel. Always, no matter what. You can only give your best in protecting all parts very good with foam and bubble foil to a maximum and then place it inside tupper ware, then into a box and do it all over again with the tupper boxes. If there is no other option than to sent it you have to go that way and give all you can while packing it. After this it is about praying to the shipping gods. Well, sadly not. It's been a long while since I did this project and I can not remember exactly what colours I have used there as I do not paint with colour reciepes. I always try to paint what I want to see there, but have no intentions on making it only available if I use specific colours. Sorry. Id just like to thank you guys for the Art book, its an inspiring prize and has already helped me formulate ideas for my next piece. I really appreciate the personal touch from Roman and I will always happiness in painting. 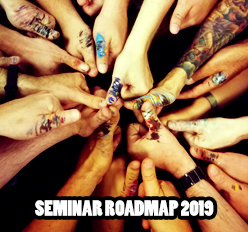 I hope to one day be able to attend one of your awesome classes and learn from you. Well, as far as I can remember I went from a basic skintone from VMC over a warm orange mid light to a cold light by adding more and more white with a dot of ice blue in it when I went for the highlights. 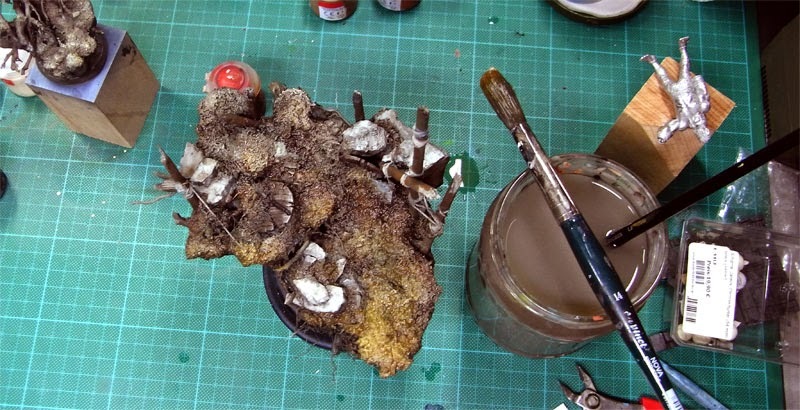 A lot of the colour variations was done via glazes afterwards: reds, purples in the skin.